Apply the latest upcycle fashion ingenuity to upcycle your tired old clothes and thrift store finds into trendy new threads! 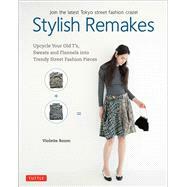 Stylish Remakes shows you how to give new attitude to the stuff you have had in your closet for years. And it's so easy! With just a little time cutting and sewing you can create fun and funky new pieces from old flannel shirts, tees, sweats, bandanas and more. It's inexpensive (often practically free!) and fun to do. And it's completely up to you to create your own personal fashion style! You can do all this with no previous sewing experience and a minimum of time and fuss. Anyone can do it, and anyone can wear it. Just open this book and grab some old classic duds from your drawers. Then create your own personal fashion style! Founded by Bunka Fashion Institute graduate Mari Hamano in 2009, Violette Room is a Japanese fashion company that takes inspiration from all parts of the world to make everyday clothing in relaxed silhouettes and comfortable fabrics, with details inspiring a sense of nostalgia.